i made this tonight and found it very filling. However, my squash were not done in 30 min. – more like an hour and i still would have liked them a bit softer. I don’t know if squash have to be ripe before using? Mine were rather hard, and not that orange-y color inside, more like a pale yellow (the label said Danish squash), and they were a bit large. But i would definitely make this again with hopefully better squash. So glad you tried it! That’s a good point about the squash cooking time. I actually had my squash for about a week and then baked it so perhaps that’s why mine was already really soft when I baked for half an hour. Next tiem I cook it I”ll try to adjust the cooking time and see what happens with really fresh squash. 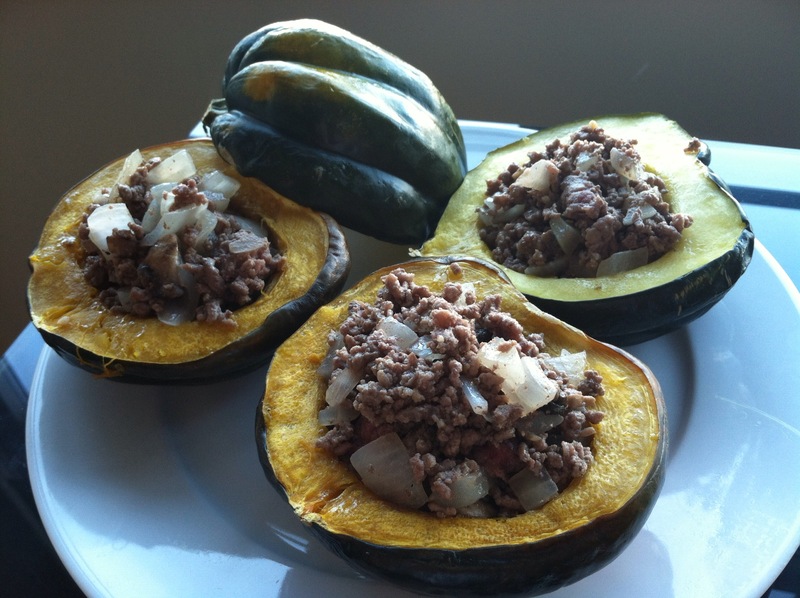 I love acorn squash. Never had it wit meat in it though. Baked or steamed with butter, cinnamon and nutmeg. I will have to try this. I used a small hubbard squash and baked it for 50 min, made the rest as per recipe except I added to Gala Apples chopped and pour a little sherry in each after I filled them. Yum, my husband ate it and liked it!